The 83-foot Christine K, owned by Jim and Christine Warjone, is a classic Monk McQueen wooden boat. The space aboard is estimated at more than 2,000 square feet. and his wife,Christine,Â own the Christine K.
Arizona, two places with no saltwater. maintenance is not much different than on a fiberglass boat. But for me to take you on board … the trouble is, it’s not exactly on display. single-level salon and so much more. are made of. And it’s always fun to dream. 500 companies, as well as whole generations of the Warjones’ extended family. yacht he loves that the last one he was given had water wings and a GPS locator. glass and shards of that new ship everywhere. Ah, the stories. parts for plumbing. “Whatever was needed I could mostly do on the boat,” he says. wanted a Monk McQueen and within 24 hours of seeing it, they bought it. as much as the median cost of a home in the Seattle area. over the Gulf Islands, Desolation Sound and the San Juans, but no farther. to give to the Lock guys who helped them maneuver the lines. in real estate. Right now it is turning around and is on the upswing, he says. $10 million yacht, and Aggen has seen one sell for $5 million. 500 list, as well as C level execs and business owners of all size companies. is on the customer list as well. 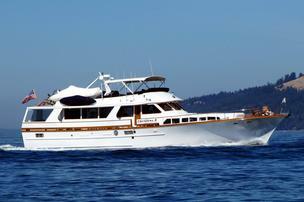 it, in its permitted moorage, is selling for $500,000. “It’s turnkey to put your groceries in and go,” says Aggen.